Milt Stegall, the legendary Winnipeg Blue Bomber slotback, made an appearance at the Bomber Store in St. Vital Centre on Saturday. He was joined by his former teammates, Doug Brown, Obby Khan, Chris Cvetkovic, Shawn Gallant, Neil McKinlay and Jon Oosterhuis. Dancing Gabe made a brief appearance as well. He picked up an original autographed photo of himself with Milt that the team had put together for him. If you can’t get enough of seeing your favourite players up close, the team will be holding a fan forum on Tuesday beginning at 6:30 p.m. Everyone is welcome. 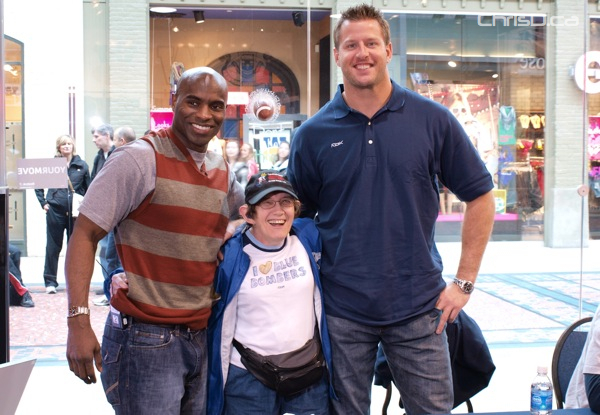 Pictured above: Milt and Doug take time to pose with a genuine fan decked out in her favourite Bomber gear.